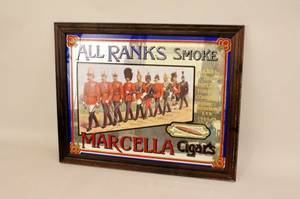 Wooden framed mirror advertisement depicting a row of different military soldiers walking in a straight line. Text on ad reads "ALL RANKS SMOKE MARCELLA CIGARS, ISSUED BY THE IMPERIAL TOBACCO COMPANY OF GT. BRIT. AND IRELAND LTD."